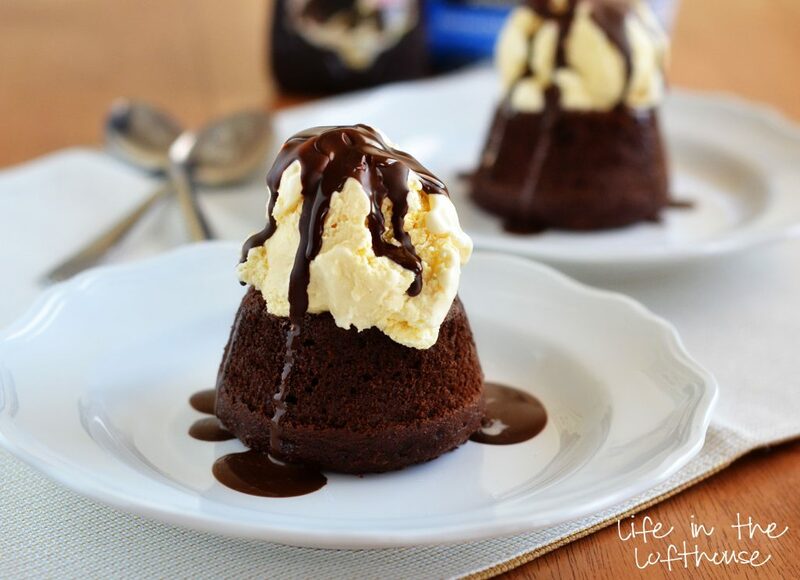 Easy Chocolate Molten Lava Cakes are mini chocolate cakes with a warm center of hot fudge, topped with a big scoop of vanilla ice cream and then drenched in chocolate magic shell. They are amazing! 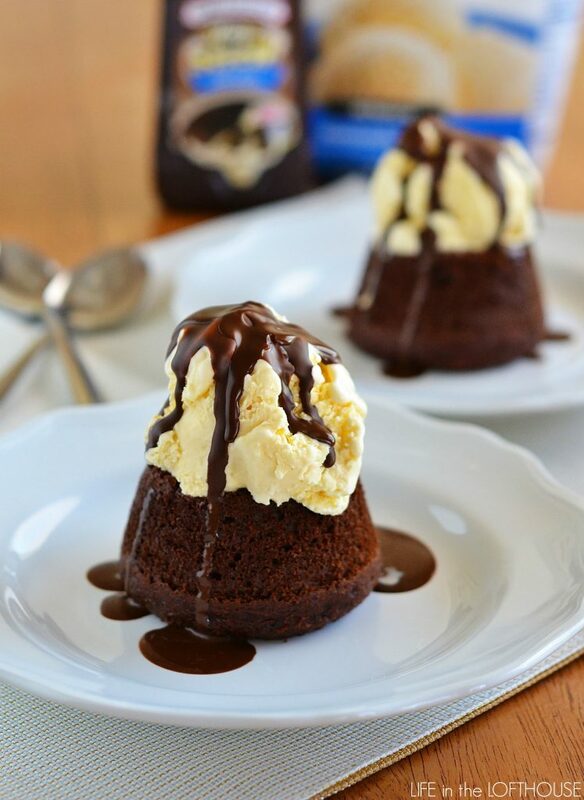 One of my favorite desserts ever is the Chocolate Molten Lava Cake at Chili’s restaurant. 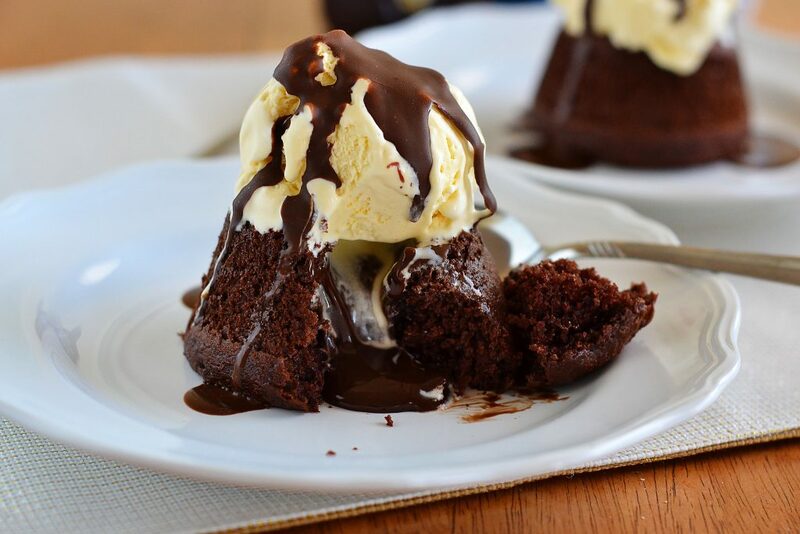 It’s a small chocolate cake with a warm center of hot fudge, topped with a big scoop of vanilla ice cream and then drenched in chocolate magic shell. It is amazing!! 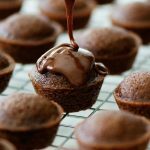 We don’t make it to Chili’s too often, so I was excited when my little sister told me about a you-tube video on how to make these Easy Chocolate Molten Lava Cakes at home! 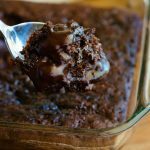 These divine chocolate cakes could not be any easier to make, and they are so impressive for dinner guests. I totally love that you can freeze them, too! The recipe makes 9, so if you don’t need all 9 immediately just freeze the rest for later. All you do is pop them in the microwave and nuke em’ for 30 seconds. 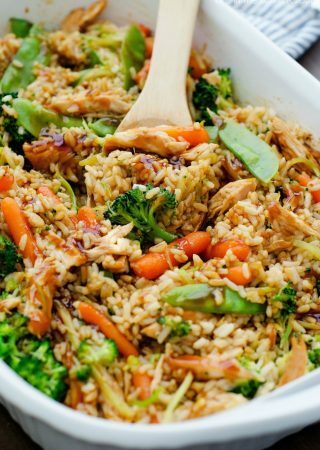 So easy, and soooo good! 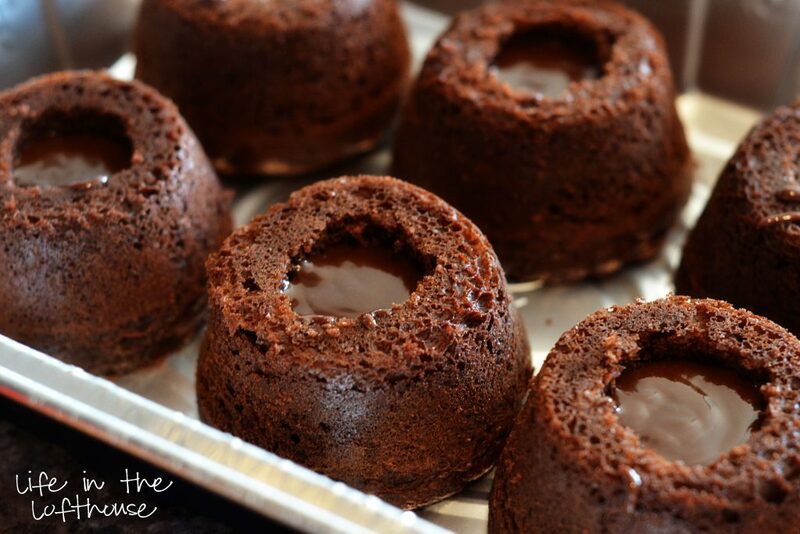 A warm, chocolate mini cake with molten chocolate that oozes out from inside. 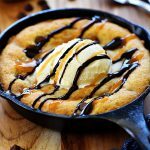 Serve with vanilla ice cream! Preheat oven to 350 degrees F. In a medium bowl, add the cake mix, water, vegetable oil and eggs. Beat with a hand mixer, on low speed for 2 minutes. Grease a Texas-size muffin tin. (The Texas-size pans usually come in 6-cup pans) Fill each cup ⅔ full of cake batter. 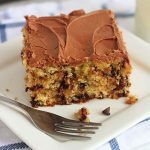 This recipe makes 9 cakes, so you will have leftover batter if you only have one pan. Bake for 25-30 minutes, or until toothpick inserted in center comes out clean. Let cakes cool for 10 minutes in pan, then take a knife and loosen the edges. Carefully remove cakes from the pan, and place on a wire rack to cool. ( If you only have one Texas-size muffin tin, like me, clean the pan, and fill with the remaining batter. You should have enough batter left to fill 3 more cups ⅔ full. Bake for 25-30 minutes. Let all the cakes cool completely. Then take a knife and slice the ‘dome’ off the top of the cakes, so they are flat. (Pictures below demonstrate this part) Once the tops are flat, turn the cakes upside down. Using a sharp paring knife, cute out a 1-inch circle out of the center of the bottom (now the top) of each cake. The hole should be at least 1-inch deep. Scoop out the chunk of cake and discard. Repeat this process with all the cakes. Warm the hot fudge in the microwave according to it’s directions. Spoon 2 Tablespoons of fudge into each of the holes in the cakes. Store the cakes in a sealed container in the freezer for at least 3 hours before serving. You can store them up to 2 months. When ready to serve, take one cake and place on a microwave-safe plate. Heat for 30 seconds. Remove from microwave and top with one big scoop of vanilla ice cream, then drizzle on Magic shell. Serve and enjoy! 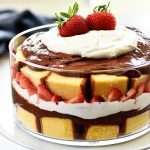 We love these desserts…..now I can make them at home!!!!! Thanks bunches! Oh boy! I love all that ooey gooey chocolate coming out!!! These look great! And so easy 🙂 Thanks for sharing! These look terrific but I am having trouble pinning ’em! Courtney, that’s odd. Not sure why… I’ll look into it. These look delicious! Can I freeze them? Don’t throw away the tops! When they cool, crumble them in a food processor or by rubbing them together and dust the top of your ice cream with them! I made these tonight. They were great and actually easy for me, who doesn’t bake! I used an apple corer to make the hole for the hot fudge. Also I used the cake trimmings to make cake pops! I made these for my sons birthday party this past week and they were a big hit. I made them the night before and froze them. We took them out at the party and popped each one into the microwave for 30 seconds then added a scoop of cold vanilla ice cream to the top followed by the chocolate drizzle shell. The cake was warm and the molten chocolate on the inside was warm and oozy. 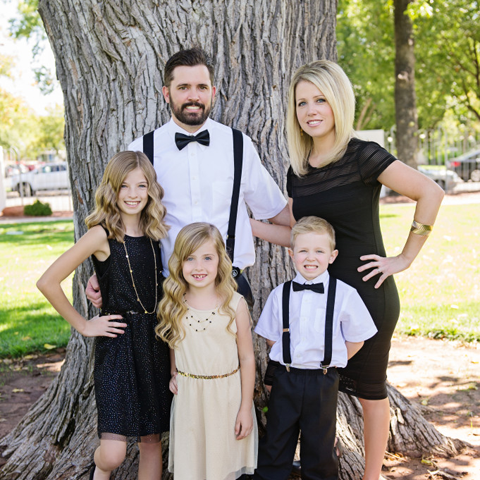 Talk about special and fancy (although way easier than they look)! Thank you for posting these Holly! Do you have to freeze these for 3 hours?